Baseboard Trim - What is the trim piece that goes along the baseboard? I'm looking for alternative to quarter round and I really like this look. Thanks! God Luck....has a nice ring to it. What are the dimensions of the door trim? And the cap piece? This a beautiful detail with lots of character, yet so clean and simple. Thank you. Lighter Tan/Green - "Favorite Tan"
Darker Greenish/Blue - "Library Pewter"
No Stain, Just a Clear Coat. Fir does it's magic over time. Thank you, Yes, the door is Simpson Door. Ordered via Frank's "The Door Store" in North Seattle. 8 '-0" Tall. enjoy! Is the floor doug fir, too? It looks beautiful with the doors! Thanks for the Compliment. The floors are actually 2.5" wide American Cherry. Cheers! Entry Door - What stain was used for the front door? Fiberglass or true wood? Thanks! Yes so what type of floor is this and what color stain is used? What color is on the walls? Thank you. what brand is the front door and where to get it? - Need to find new front door with right sidelight and love the look of this door. With natural wood. If you have nice wood elements, keep them natural, but set them off with white painted wood trim. 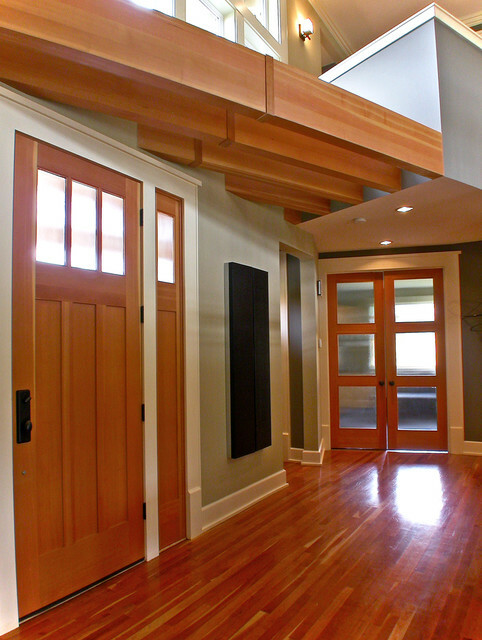 If the baseboard trim and door casings here were natural wood, none of the elements would really stand out, especially against the wood floor and the decorative joists above the door. Add white painted trim to the mix, though, and all of the high-quality wood detailing stands out. Do NOT like this. Hoping our house doesn't end up looking like this.